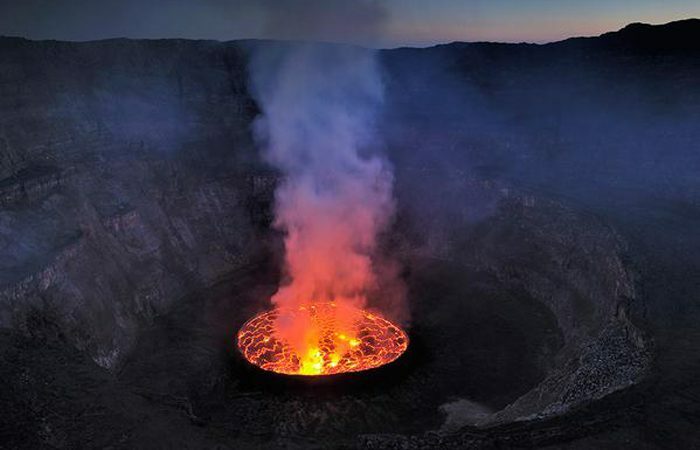 4 Days tour of Congo hiking Nyiragongo active Volcano and mountain Gorilla trekking in Virunga national park. Enjoy an adventurous expedition including Goma city tour, Virunga gorilla tracking and a remarkable Volcano hike. This tour starts and ends in Kigali, Rwanda. Your Congo tour starts and ends in Rwanda. Your trip to Congo will start when you are picked up from your hotel or from Kigali international airport by our Gorilla Cousins guide who will drive you to Gisenyi town on the Rwanda-Congo border. Upon reaching the border, the travel documents will be verified before you cross over to Goma in the democratic republic of Congo where you will check-in to your hotel or lodge. You will have an early breakfast before driving to Bukima park station in Virunga National park for your Congo Mountain Gorilla trekking. Upon reaching you will be briefed and assigned a gorilla family to track. You will also meet the Congo gorilla tracking guides at this point. After meeting the guides, you will proceed with your gorilla safari where you follow the gorillas into the wild. Taking pictures is permitted, though you are required to disable the flash. The gorilla trekking exercise will take about 1 hour. You will wake up early in the morning eat your breakfast, and proceed to the foothills of Nyirangongo Volcano in Virunga national park. You will follow the Nyirangongo trail and climb up the volcano with the trek taking up to 6 hours with impressive scenic views and encounters with rare birds and wild animals. You will spend the night at the edge of the Nyirangongo crater in tents, where you can clearly see the active lava lake. You will have an early breakfast and by 8:00 AM set off for the Kigali city in Rwanda thereby marking the end of your 4 day Congo tour. Searching for the most memorable holiday in Uganda, Congo or East Africa at large? Explore Rwanda Tours is so ready to make your dream come true. We offer safaris at unbeatable prices. Explore Rwanda Tours is proud to be affiliated to the follow highly reputable tours and travel associations. Copyright © 2019 Explore Rwanda Tours.